Venn Growth Collective is made up of two seasoned individuals who have been around the world in their travels, and around the block when it comes to working with world-class clients. When they asked us to build their website, we used SquareSpace, a popular on-line tool for building websites. That's because it's easy for non-seasoned technical people to use and update. 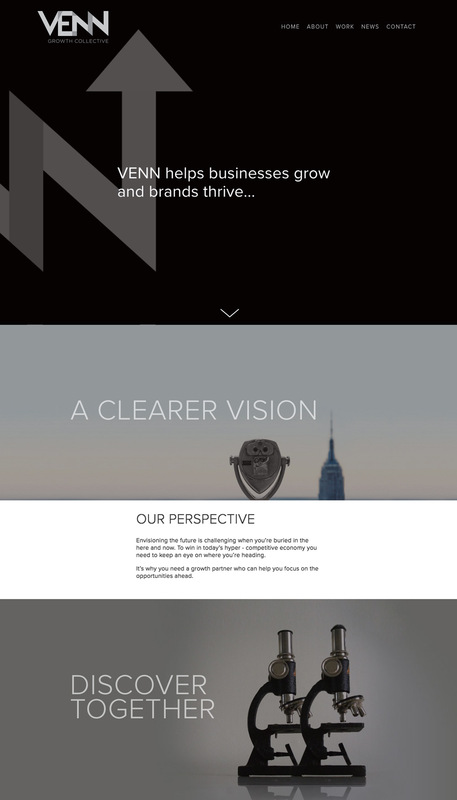 You can see SquareSpace's templates here. Their templates provide the basis for the framework for a responsive website. Of course, the template requires someone who has some expertise to customize it with images relevant to your company and content written for the web. How do you decide if you should write your own copy for your website, or have a professional writer do it? If you're not a writer, you probably shouldn't write your own website. If yo are a writer but not familiar with how to write for the web, which includes incorporating SEO into your content, then you probably shouldn't write your own copy. To learn whether you should write the content for your website, read our blog about it here. If you have questions about a website for your company or organization, let's chat.